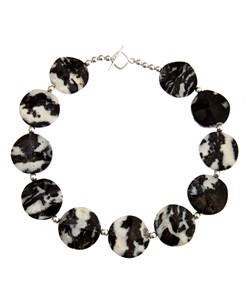 Karibou mexican zebra jasper necklace is gorgeous. Smooth discs of Mexican zebra jasper measuring 1 1/4 inch in diameter feature free-form cuts for added dimension to their round shapes. Set off by small sterling silver beads, this necklace, with its rippling coins, is sure to be noticed. Sitting closely to your neckline, the piece measures a total of 18 inches long and fastens with a toggle clasp.Metal: Sterling silverStone: Mexican zebra jasper. Pendant measurement: 1 1/4 inches in diameter. Necklace length: 18 inches.